Two nights ago I had real trouble sleeping and in one fitful flop, I solidly clotheslined my alarm clock with the business end of my pillow. Knowing that most manufacturers drop test there products from three feet onto hardwood surfaces, I was reasonably certain that the clock would be ok. I heard batteries take a long roll under the bed and that was enough for me to forget about it until the morning. Once the clock was fully assembled I was disappointed to find that the speaker wasn’t working anymore. My face sunk as I remembered how difficult it was to find an acceptable alarm clock the last time I was shopping for one. In college I participated in a design competition for what was then the world’s largest clock manufacturer (they have since been sold or gobbled up by someone else). I understand the struggle they have to be profitable. There are lots of things that tell time now. Because of cell phones, nobody wears a wristwatch unless they like jewelry. If you add a clock to something else, it cheapens it. How many products do you know that are like this? Think of the king of does-it-all: the swiss army knife. Nice. Expensive. Now add a little LCD clock to it. Junk. Weird isn’t it? Once you get past styling, functionality and performance what are you left with to differentiate yourself? Features! What else can we pack into this little box? Ugggh! If I wanted all that other stuff I would have bought something that does those things primarily and happens to tell time. I’m not saying variety is a bad thing because everyone will have slightly different priorities. For example, my bad eyesight makes large numbers a real plus. On the other hand, you might want the smallest clock you can find because your night stand is tiny. If someone is buying an alarm clock, it is because that is primarily what they want it to do. Focus on making a good alarm clock not a waffle iron with a snooze feature. There are hundreds, maybe thousands, of clocks available but you would be amazed at how few of them meet these simple criteria. After my pillow fight, I did some online shopping. After five minutes of dedicated looking I could not find one clock that would be a suitable replacement. That is crazy! I could look up the picky differences between a Roth IRA and a Traditional IRA in less time. The closest I came was this at Target. I actually thought I had found an upgrade for a few minutes. I was going to get everything I wanted and always visible alarm time. They couldn’t resist. They had to stick in a solar feature (which would have been fine if it worked). The problem is that they did it at the expense of the basic features of the clock. Look at the customer comments! Why doesn’t a clock e-tailer design a website that allows the user to search the top 50 features on clocks in checkbox format? To stem the tide of comments (which would be great to get on the blog to stimulate discussion rather than in an email just to me), I know that there are websites with this idea in a limited capacity but it loses almost all of the effectiveness if the user cannot drill down to the one or ten clocks they are really interested in. Why not have searchable tags on the clocks? This is different than a standard Google-like word indexing. If I type “battery powered” in a traditional search it will return battery powered clocks, solar clocks that don’t require batteries, line voltage clocks with battery backup, etc. This story does have a happy ending. After disassembling the clock, checking every connection and putting it back together again it magically worked. I’m not sure what the problem was but I am very glad that it is fixed. I wonder if decent basic alarm clocks are even made anymore. How about the Zen alarm clock. Funny but strangely compelling…. Thanks for the comment and thanks for doing a little searching on your own. If so, then no thanks. I’m sure it has a pleasant sound and it looks ok but it misses the mark on a lot of the other things I mentioned above. I got mom one for Christmas a couple years ago (if I could find a link I would add it) and she loves it. It projects the time on the ceiling. We have one and the projected time doesn’t keep us from sleeping and we can’t believe how useful it is. So this is mainly just a plug for a clock that has time-projection. It sounds like your mad electronix skilz took care of your original anyway. The thing I hate most about shopping for alarm clocks is that there is no way to hear a sample of what the alarm actually sounds like. There is that one alarm in particular that sounds like a warning you might hear if you worked in a nuclear reactor that was about to go into meltdown. It would be nice if they let you select from a small assortment of sounds. Simple features are definitely better then multi-button functions. Very good points Mr. H. The picture in the header is my actual alarm clock. It is a Westclox and it really is a great clock. On the packaging and on sites like Amazon, one of the things they should list is the db of the clock from some set distance. Even if you couldn’t hear it you’d at least have a standard for loudness comparison. The other option would be to have it adjustable along with the particular sound like you mentioned. I had the fabulous Westclox pictures all ready and then my work computer was hijacked by some malicious software. IT told me they would have to re-image my hard drive. Looks like it will be next week. My computer is now clean! I wish I had an IT department at home. Now, where was I? Oh yes, the Westclox student design competition, circa 1992. Patz failed to mention that his team took first place for their design of a travel alarm clock. Well, here it is! The award winning clock. 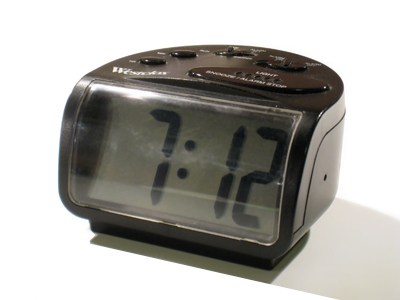 And just for nostalgia, I’ve included a pic of a travel alarm clock design that I submitted as well. I wonder if it meets all of Patz’s stringent clock design criteria?